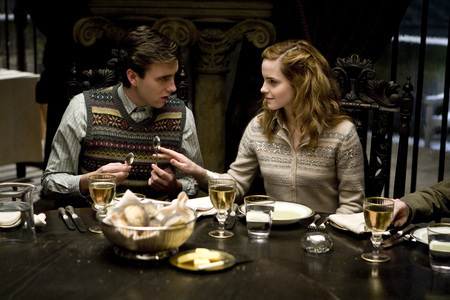 hermione and neville in 6th साल. hermione and neville. Wallpaper and background images in the Harry Potter फिल्में club tagged: hermione neville. This Harry Potter फिल्में photo contains रात का खाना, कॉफी ब्रेक, चाय ब्रेक, कॉफी तोड़ो, and खाने की मेज. There might also be चोली, ब्रासेरी, मार्टीनी, मार्टिनी, एक प्रकार की बन्दूक, छुट्टी रात्रिभोज, and छुट्टी का खाना. What in the world is this scene from? It must be a deleted scene or something, because I don't remember this in the actual movie.